Below: Photos from a good friend and collector Peter Parkinson. Peter makes some of the finest recreations of FS knives in the world. This group is all WW-II vintage with some very nice specimens. The named knife and the P-1 are both stunning examples. The P-3 with Wilkinson etch is also quite rare. Below: Here are some photos given to me by a fellow collector illustrating his splendid collection of Fairbairn Sykes from WW-II. Many of these are very rare models and display the tremendous variety of the F-S genre' facing would-be collectors. Below: Another breath-taking display of Wilkinson Sword's finest cutlery. This photo was sent to us from another collector and friend of ours. These two photos provide proof (my dearest daughter) that I do not own ALL of the commando knives in the world. Love you. 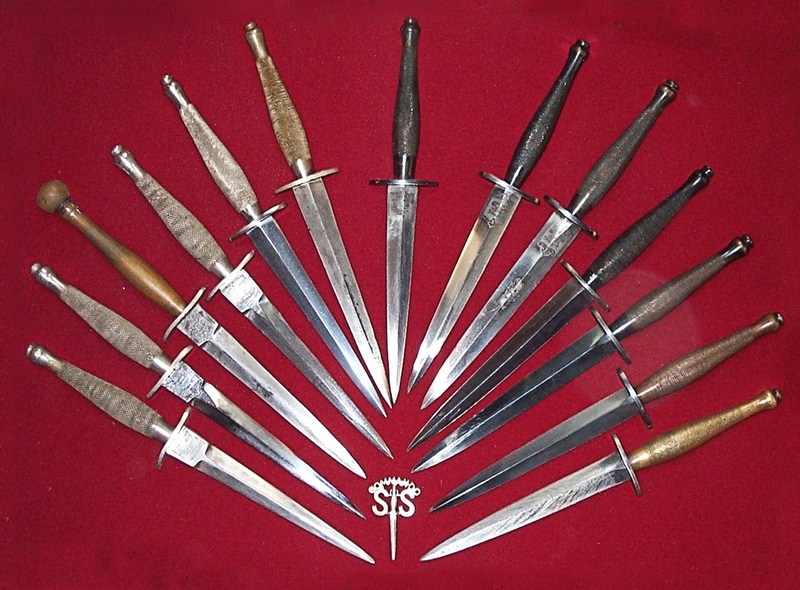 There are many styles of commando knives and we will describe all of the standard ones, most of the common variants, and also some of the extremely rare ones, some with unknown provenance and some of questionable provenance. Most of us think of the sleek, seven inch bladed, double edged dagger with either a knurled brass or ringed alloy handle as "THE Commando Knife." Before the F~S came on the scene other knives filled the gap in hand to hand fighting knives. One of the better known knives used early on by the commandos is the BC-41 trench knife. It had a brass or alloy handle that incorporated a clip pointed blade. 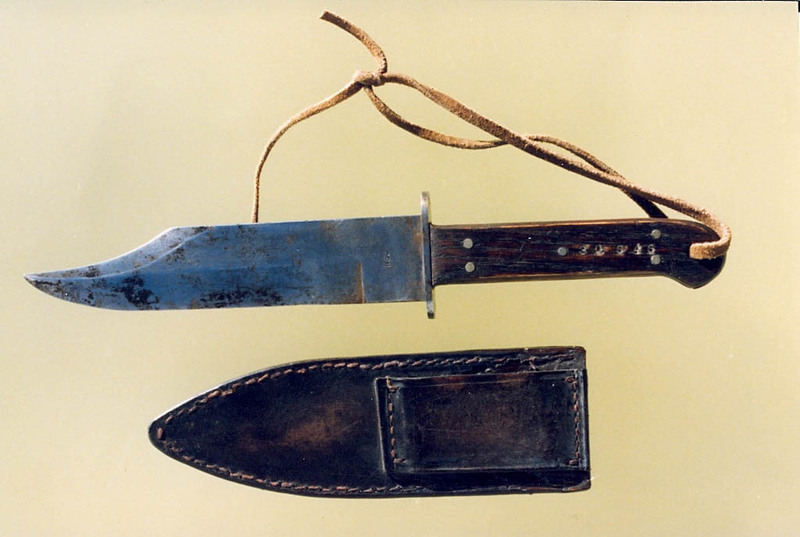 Bowie style knives (referred to as RBD knives) were also used and more than likely personal hunting knives also found favor with many soldiers. Following the end of WW-I the emphasis on hand to hand combat waned in most armies. The new military thinking was focused on mechanized warfare: stronger amroured vehicles and tanks, more powerful artillery, bigger and faster airplanes and ships. Fighting with knives was considered obsolete and old fashioned, according to the experts. Unfortunately you cannot take the human element out of war. Today Spec-Ops groups are still called upon once all of the mechanized and computerized systems have failed to accomplish the necessary goals. There is no substitute for boots on the ground and eyes on the target. Even in the age of predator drones, proper sentry elimination comes down to a man with a knife or silenced firearm in his hands. The British Fairbairn Sykes fulfills that task-specific mission as well today as it did 70 years ago. 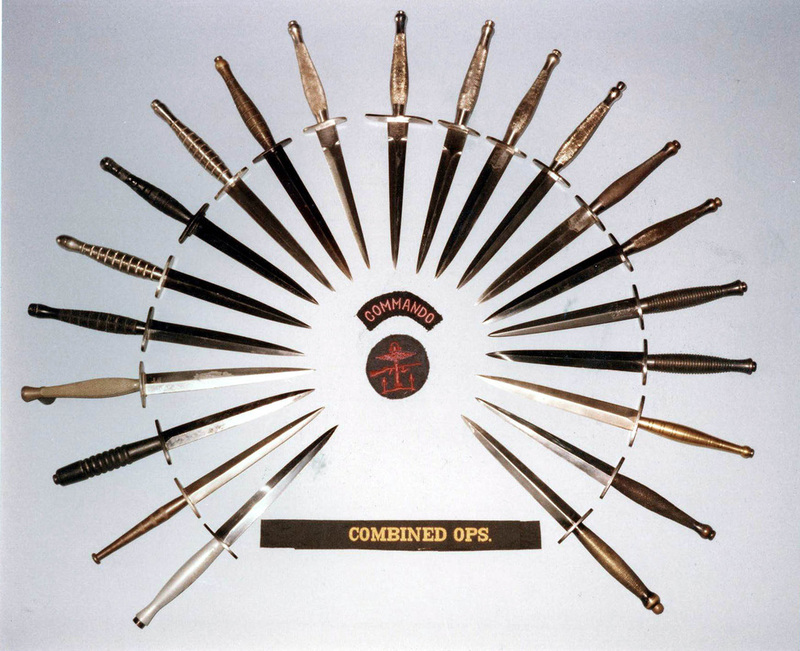 The sub-categories of this, and other, sections will familiarize you with many of the styles of "commando knives" used throughout WW-II, the small detailed differences, and derivatives of the original knives that are in use today. We hope you enjoy this exploration. 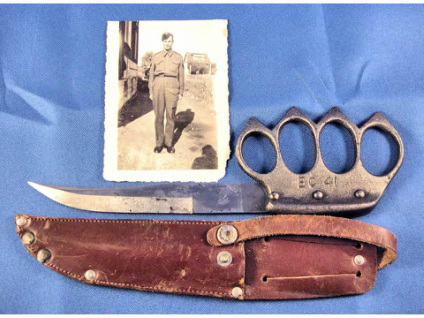 This is a typical BC41 fighting/trench knife. Pressed into service early in the war they are not an ideal fighting knife because the guard severely limits the ways in which the knife can be used. The photo is courtesy of DL. Actually this one has a more pronounced upswept tip to the blade than many I have seen. Below: "Shakespear Knife" made by Wilkinson Sword co. for a Major Shakespear serving in India. The design caught on and was requested by other hunters. They were made in very limited numbers in the late 1800s. 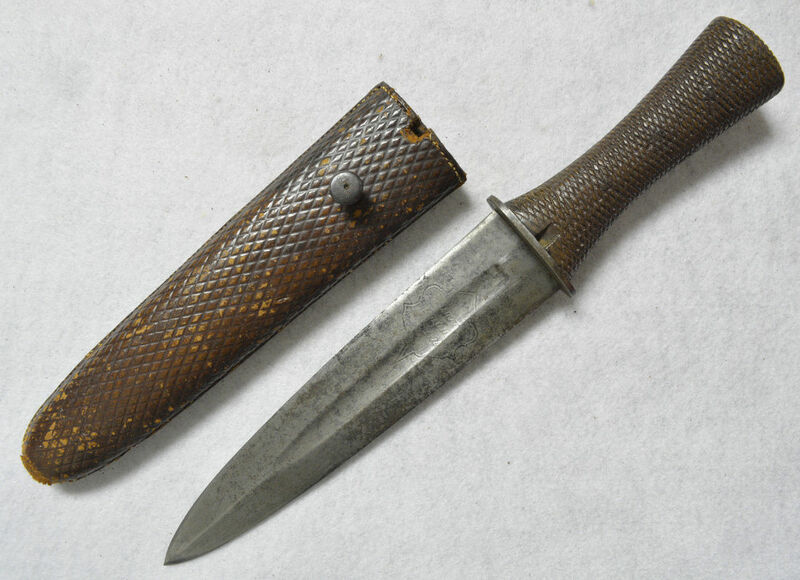 Below: Until the Fairbairn Sykes came into production other knives were pressed into service similar to this rare "RBD" Bowie-style hunting knife. 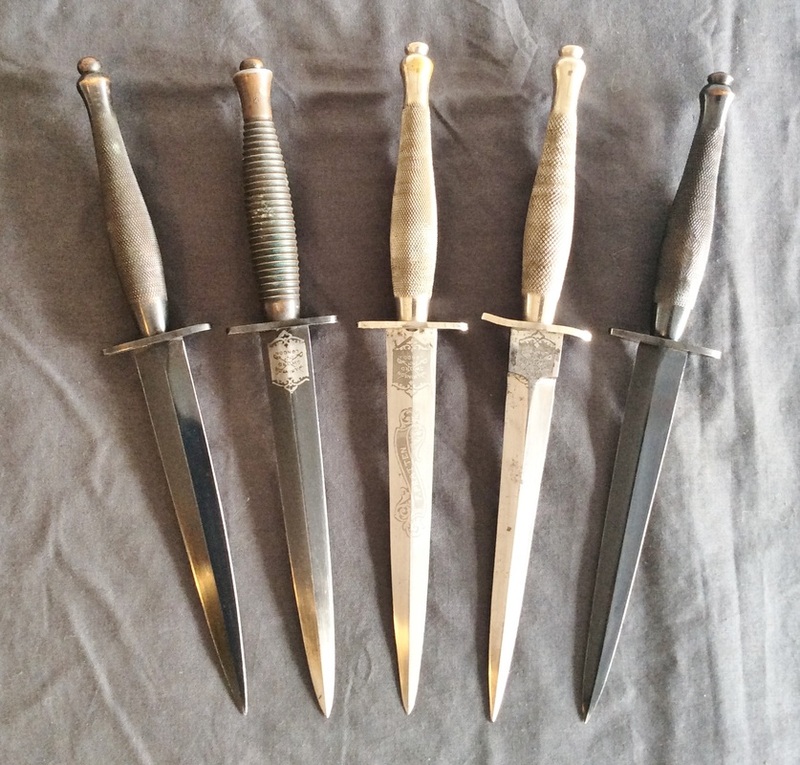 Below: from top to bottom: Original WW-II 1st, 2nd, and 3rd pattern knives. These represent the only three patterns officially recognized by the British MOD or Ministry of Defense. Wilkinson appears to be the only maker of the 1st pattern but other companies manufactured 2nd and 3rd pattern knives.